Portuguese-style bullfights are called touradas or corridas de touros, and it is distinguished by the fact that the main bullfighter 'fights' the bull on a horse. It should not be confused with the rejoneo, with is a similar horse bullfight performed in other countries, such as Spain. First, the bullfighter stabs a special bandarilha (stick with harpoon-like end) which breaks on impact leaving the metal end stabbed in the bull while the wooden end stays with the rider and now reveals a small flag which is used to tease the bull to chase the horse. Then, several bandarilhas (often 6 or more), similar to the banderillas used in Spanish-style bullfighting (but a bit longer) are also stabbed into the back of the bull, to produce pain and blood loss. During the performance of the cavaleiro there are also some ‘assistants’ on foot, called banderilheiros, who are dressed very much like Spanish-style bullfighters and who also use capotes (magenta capes). They are there to intervene if problems arise and to attract the bull when the rider changes his/her horse for a 'fresh one' (which happens every few minutes). 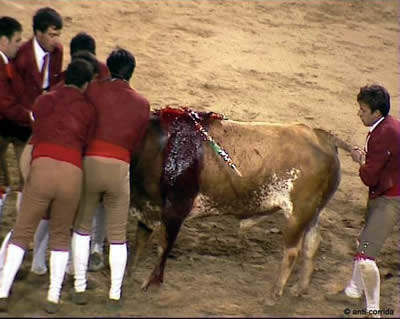 Once the bull is totally exhausted because of the continuous chasing of the horse and the blood loss, the rider leaves the bullring and the second and last part starts: a group of eight men on foot called forcados challenge the bull, without protection or weapons. 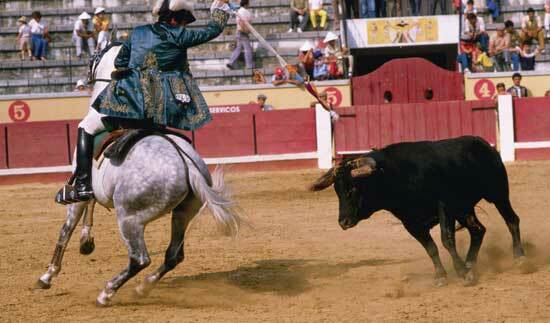 The front man provokes the bull into a charge to perform a pega de touros ('bull catch'), and when he does so he hangs on to the animal's head. He is quickly aided by his companions, who surround and hold on to the animal from head to tail until it is subdued. 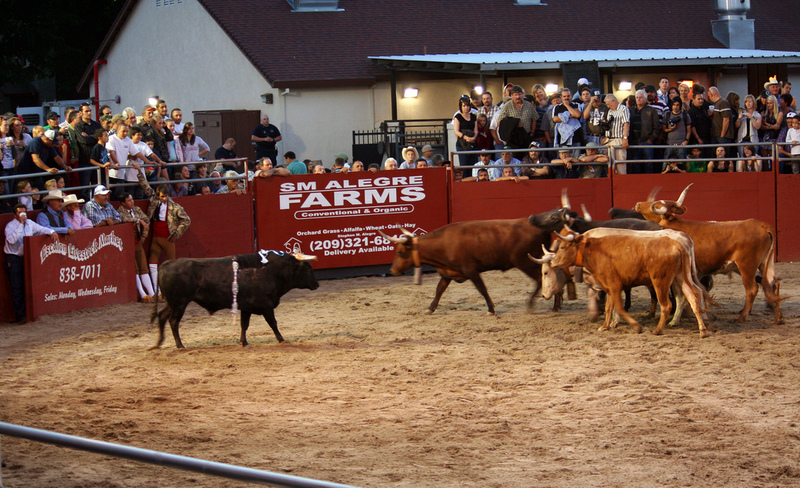 Finally, after the forcados leave, a group of castrated and tamed bulls is taken into the bullring to lure the exhausted fighting bull back out. 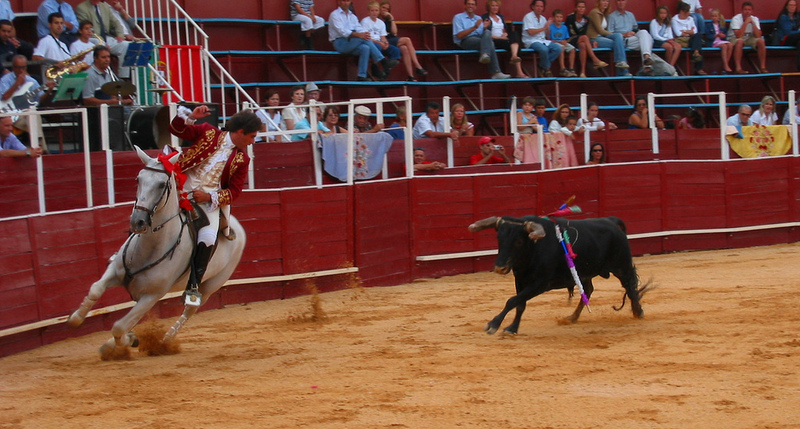 Several groups of forcados compete with each other to see who controls the bull better, but the ‘hero’ of the bullfight is still the cavaleiro. A bull was killed unlawfully at the end of a bullfight which took place last Saturday afternoon in the medieval village of Monsaraz, Alentejo, keeping a tradition that the local population has vowed to uphold despite being widely controversial. Nonetheless, for the 11th consecutive year and despite the lack of an exceptional authorisation from the Cultural Activities General Inspectorate (IGAC) due to a “lack of conditions”, the bull was killed in Monsaraz. The event was part of festivities lined up in honour of the Nosso Senhor Jesus dos Passos celebrations which have taken place every year on the second weekend of September since 1877. In 2002 a new law was introduced that states any spectacle in which the bull is killed must apply for “exceptional authorisation” unless it is in a place where it has been carried out uninterruptedly for at least 50 years as part of popular culture on a historic date. Exceptional authorisation was requested for last weekend’s fight in Monsaraz, but it was refused at the beginning of last week.